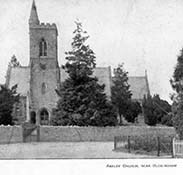 Church demolished in 1982, churchyard still exists. Church Services are now held in school. Introduction to Stained Glass: East window had 1884 Mayer & Co stained glass in memory of Revd J Helford Isley, Rector for 33 years, including the time when the church was rebuilt.